Corsica is labelled “l’Île de Beauté,” the Island of Beauty and the Tour de France is a way to show this to the world. But there’s more to Corsica than the rocky mountains and the shimmering Mediterranean sea. It’s the birthplace of Napoleon Bonaparte and by some measures it’s Europe’s crime capital, an outpost of omertà. The mix of natural beauty and man-made violence is the perfect introduction to the Tour de France. The peloton rolls past pine forests, beaches and blue seas with freewheels clicking like cicadas. But the closer the finish gets, the more the tension rises. The race funnels into Bastia for a high stakes finish where the best sprinters will fight for the yellow jersey. The race heads south from Porto Vecchio for a loop with a few small hills including the modest Côte de Sotta, 1.1km at 5.9%. Despite heading inland the roads are not too treacherous but 198 riders make or a nervous start. Then the race heads up the east coast using the Route Nationale, one of the island’s main transport axes with wide roads and a gradient suitable for a railway. There are many long stretches where the peloton can see the road ahead for a long way. The intermediate sprint is an example, a long straight road. It’s listed as San Giuliano but it’s on the coastal road, away from the twisting roads of this town. The finish gets near as the race swings by Bastia airport, taking an exposed road between the sea and the large Biguglia lagoon. I’d like to offer more insight but the route is unremarkable, taking the same road for most of the day. The first 200km don’t present many obstacles but everything changes for the last 6km. You could send the Tour de France down an airport runway and it would be dangerous because the pressure to win is huge. Not only are the sprinters scrapping for a prestigious stage win but the yellow jersey awaits the winner today. On any other day a badly-placed sprinter might back off with the next day’s stage in mind but they’ve an added incentive to fight today. In addition the riders hoping to win the race overall need to be well-placed too and will use their teams to defend a place near the front. This creates a peloton psychosis where everyone knows they need to be at the front but obviously only a few can be at the front and therefore the pace goes up, riders fight for position and so the risk of a crash soars. And so the vicious cycle spins. As the map above shows there are roundabouts and narrow sections but it doesn’t show the central dividers in the road nor the narrow railway bridge under which the race passes just before the three kilometre point. The U-turn at the 2km point is a sweeping bend but narrow and anyone in a bad position will struggle to get back. From here the race gets safer, at least in terms of the route. The finish is a drab stretch of seafront far from the centre of Bastia, a lonely place where concrete meets salt water. But for one day it becomes the centre of the world. A fast start is likely because the Côte de Sotta. Just one point in the mountains classification awaits but whoever gets it stands on the podium and arguably earns more publicity that winning many a race elsewhere on the calendar. Expect the likes of Vacansoleil-DCM, Sojasun and Cofidis to go berserk for this prize. Onwards and a move is likely to get away but too many sprinters’ teams will lead the pursuit. The wind can howl on the Corsica coast but – forecast below – not today. The intermediate sprint is of interest, will the bunch sprinters contest this? If a small group is away then they should because these points count. I see three prime contenders for the stage win. Mark Cavendish (OPQS) is the first choice because he delivers with postal regularity, no wonder his native Isle of Man has issued stamps with his image plus he’s got an agility and versatility to his sprint. André Greipel (Lotto-Belisol) is next, a genuine rival but neither has raced head-to-head much this year and Cavendish has won twice ahead of the German, in Tirreno-Adriatico and the Three Days of De Panne. 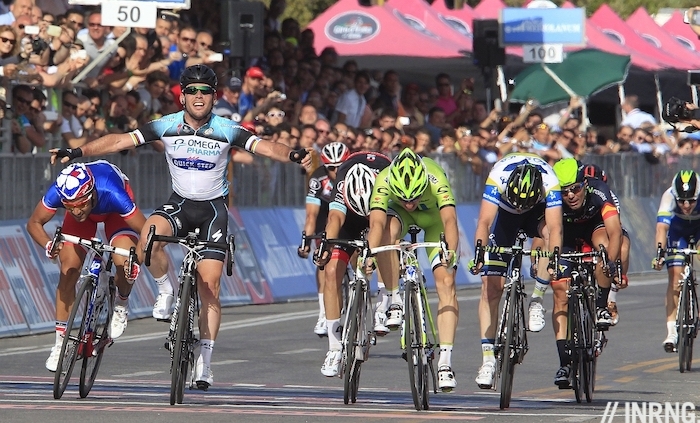 Recently the Ster ZLM Tour saw Marcel Kittel (Argos-Shimano) beat the pair and he’s my third choice. He’s just hit a personal max power record in training too. But the sprint will see many more in action although one theme this year is the scarcity of sprinters. Garmin-Sharp leave out Tyler Farrar, Thor Hushovd stays in Monaco, Belkin focus on the mountains at the expense of Theo Bos and Mark Renshaw and so on across other teams. Many have given up challenging Mark Cavendish. But note Argos-Shimano are the contrarians with two sprinters, John Degenkolb has won stages in the Vuelta and Giro and is more than Plan B for the Dutch team who are even trying to brand their sprint train with the “Team Argos-Shimano Express” label. Peter Sagan is the fourth pick, he could win but says he’s been working on his climbing, perhaps this costs him pure speed? Matthew Goss has been trying, confidence seems to be his biggest problem but he’s got a high speed lead out train. FDJ’s Nacer Bouhanni is fearless and has a useful lead from William Bonnet and Murilo Fischer. Katusha’s Alex Kristoff is more in the mould of Sagan, able to win on harder days but also pops up when it matters and each time he wins it’s surprise but the manner of his win rarely leaves any doubt about who was the best. Robert Ferrari of Lampre-Merida can regularly run top-5 but sometimes has his day and Boy Van Poppel is also very quick and will want to match his father’s tally of nine Tour stage wins. Finally J-J Lobato because the Basque team’s winter revolution has led to sign “foreigners” including this southern Spaniard who is proving very quick. Weather: it can be windy by the coast but the race gets treated to a calm and sunny day, a 5km/h breeze from the north-east and temperatures of 26°C (79°F). Ideal conditions to show off the “Island of Beauty” and its coast. TV: live coverage all stage long. The race starts at midday Euro time and you can watch them roll out until the départ réel at 12.15pm. Tune in to watch the early move go clear but once the loop around Porto Vechhio is done after 90 minutes, I can’t see the interest of watching the race proceed north along the coast. Watch for the HDTV images of the sea but Corsica’s beauty is the mountains and the coastal road here is a jumbled mix of farmland, campsites and retail parks. The intermediate sprint is predicted for 3.30-4.00pm but tune in around 4.30pm to get the approach and the sprint. The finish is expected between 5.00pm-5.30pm. The 10 second spin: a fast start, a breakaway but it’s brought back. Skip the coastal procession and tune in for the last half hour to watch Mark Cavendish (OPQS) win but the discount the usual certainty of a win by the crash risk. Thanks for the stamps link; a definite purchase. I think you may have the point; we’ve seen Cavendish bounce down the road on early stages in GTs before. This is perhaps the most important stage for sprinters, outside of the Champs Elysee, for several years. I’m hoping it will be CVNDSH, as the yellow would be a fitting reward for a rider of his class, but if I was a betting man my money would be on Greipel. He just seems to stay upright more often. Inrng do you know what Kittel’s max power PB was? No, sorry. I gather he’s been around 1900W max in the past. How could you not have predicted the bus? The peleton was all together when the bus got stuck. The refs easily could have neutralized or even stopped the race completely until the finish line was cleared. Why didn’t they? It’s a huge decision to stop the world’s biggest bike race. To neutralise to the finish means, under the rules, the stage is void. Right or wrong the race has been a business from Day 1. I didn’t mean stop the race completely, only until the finish line was open. It’s not very different from a train crossing. Previous post: Who Will Win The Tour de France?